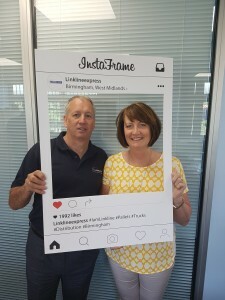 With Linkline’s new and exciting social media campaign underway, now is the perfect time to engage with our customers via a bi-monthly newsletter. The aim of the newsletter is to engage with our exisiting client base, in order to inform, share and celebrate all news and developments about Linkline. In each edition we’ll be sharing recent activities, our goals, industry challenges and even an insight into some of the individuals who make Linkline a success, in the IamLinkline feature. In our August edition and our first IamLinkline, we featured none other than the Linkline Directors Gerard & Rita Culbertson. What do you enjoy most about working for Linkline? Being able to make positive decisions to drive the business forward and watching our team develop in their roles. Tell us a joke – I was walking down the street the other day, and a power tool fell on my head…honestly, out of nowhere and Bosch.